Savasana in theory should be one of the easiest poses; lying like a corpse on a mat for the last few minutes of class. However, for most of us it’s the most challenging; unless you are one of these enlightened folks who discovered how great it is as a beginner in which case I applaud you. I’m particularly aware of savasana’s difficulty as I sit in someone else’s yoga class and watch a few people sneak out just as the lights dim and the music quiets. I get that. I totally get that temptation to leave. “Oh, I can use those extra 2 minutes of time to beat the rush and get on to my next activity.” Believe me I totally get that feeling because I have often times spent these last few moments thinking about what I have to do after class. In fact I wrote (mentally, not on my laptop) this blog post while in savasana in the class that I just attended, which is why I have lately been noticing that my savasana time is spent pondering the class, thinking about how I can turn it into a blog post or what elements I can add into my own sequences (I have some great teachers in studios around me so I love adopting some of their ideas). However I am missing out on what is possibly the greatest moment of my day…or week. A few blessed moments of pure silence. Me and my breath. No thoughts, no ponderings, no musings. Those are all synonyms, but I’m a bit jazzed up after this rather intense yoga session. My legs are actually still shaking. My goodness that is hard, just me and my breath. What?! When I first started yoga – forget it – I didn’t even try to participate in savasana. I mean, I lay there of course, but I desperately wanted to take off early with those other people who were probably already checking things off their to-do list. “Ahhhh it’s killing me,” but the fear of offending a teacher (and teachers do not appreciate early departers) kept me there, and in time my appreciation grew. As I started a regular practice, I began to relish those moments. What’s 120 seconds going to accomplish in the scheme of life, even 300 seconds. Maybe by laying there and delving into meditation I am ultimately making room for more productivity, more appreciation, more happiness! Who knows, but I like to think so. Savasana is arguably the most important part of a yoga session. This is when it all comes together; when the mind and the body integrate all that they have learned and experienced in the last hour. It allows the body to get back to neutral, release stress and affords us the opportunity to take note of how the body now feels. Play around with savasana. We can execute it in a number of different manners. Try props – like a blanket under the head or a bolster under the knees. Lie on the side if lying flat is uncomfortable. Allow some freedom to experiment. If clearing the mind sounds like an impossible feat, focus on your breath and each time your mind wanders acknowledge the thought, send it away and return the focus to the breath. It’s unlikely we will be reaching transcendental enlightenment at the end of a yoga class between school drop-offs and rushing back to work. Let’s cut ourselves some slack, just keep trying, and enjoy the quiet. In the meantime, check out Yoga Journal‘s marvelous step by step on how to get into and reside in corpse pose. I am just returning on a flight back from Austin TX. 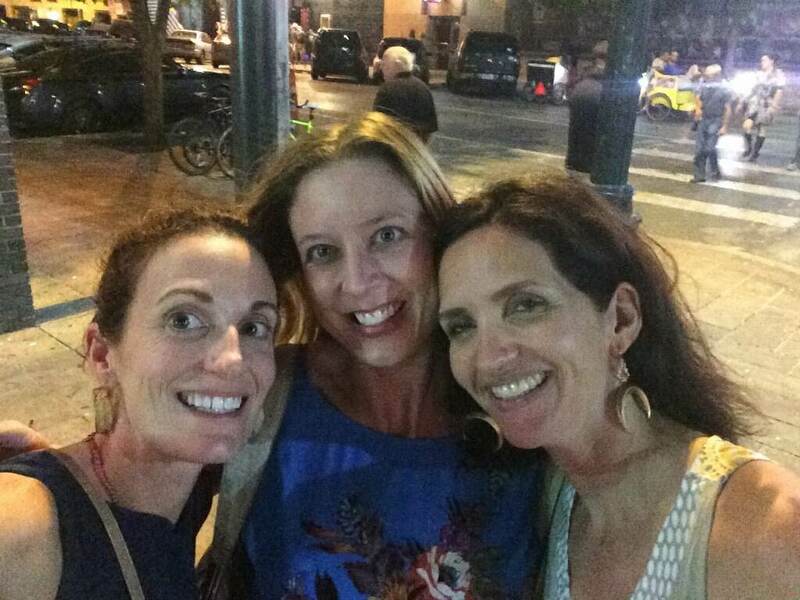 48 hours in Austin with 2 of my best gals made for a fantastic weekend. We haven’t seen each other in 2 years but we “talk” via group email nearly everyday so when we see each other we plunge right back into our old groove. There is something so mentally cleansing about spending a weekend with “old” friends. After four years of living together in college, we know even the most random details about each other. It’s 2 days of mutual therapy and endless laughter. We are all juggling, raising families, working, being wives, working out, getting involved, staying at home, staying smart, and trying to look darn good while doing all of this. We need a couple of days to get away to quiet the endless chatter in our brains and recharge our batteries. At any moment in our weekend, it can be guaranteed we have a cocktail in our hand, whether sitting by the pool, sitting in the lounge, sitting in a restaurant, sitting in a steam room (ok, no cocktails in the steam room), and one of us relaying a recent drama, a recent NPR story, a retelling of a recent movie, a crazy work story, a frustrating husband story, a hilarious kid story, or any combination of the above. Talk about unloading. Our convos may not be earth shattering but it’s like having a confidential panel discuss, appreciate, validate, and advise without providing all the solutions. I love that about girlfriends – we offer advice without it sounding like we just solved all problems. Oh of course, we capped off Saturday night with a midnight yoga session, probably not the most elegant sight. Not only was the weekend an amazing time spent with 2 amazing women who are doing amazing things, but as I return home, I feel so refreshed and ready to get back to my routine. Today (this is the day after I started writing this entry), the kids and I made Halloween crafts and went for a fantastic fall hike, all done enthusiastically by all parties. They were psyched to see me – a couple of days without mom definitely made the heart grow fonder – and probably needed the break just as much I did. On another note, Austin is a great spot for a girl’s weekend. We could all fly direct (a “middle” ground for CA, CO, & MA). It’s small so can be easily explored in 2 days and has a fun and bizarre mix of cowboys, college students, and hipsters. Here are my recommendations. Keep in mind I was only there for a weekend, so I only know what I know (that’s very yoga’y). 6th Street: A crazy nightlife scene, think Bourbon Street but smaller. A long corridor of bars, the street closes to cars in the evening and fills up with mass amounts of college students. Parkside: A nice respite from 6th Street, this restaurant is definitely more civilized than its neighboring establishments. South Congress Avenue (SoCo): If you are looking for something a bit more mellow than 6th St, this strip has a wide array of restaurants and eclectic shops; including my favorite, Heritage Boots – a purveyor of handmade cowboy boots. Perla’s: A great al fresco dining spot to end an afternoon of shopping along South Congress Avenue. Bats – Austin is super into their bats. I believe we were able to catch the tail end of bat season before they migrate out with their pups, which makes the bats seem rather adorable. Festivals – Austin seems to always have a festival going on at any given time. This past weekend was ACL (Austin City Limits) a massive music fest, and of course there’s SXSW (South by Southwest), the major film/music fest with a variety festivals in between.